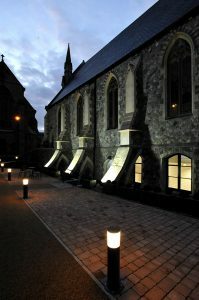 Cornerstone has recently been given another accolade in addition to its increasing popularity and reputation for good food and warm hospitality as well as being an outstanding venue for meetings, charity events and exhibitions. The former Ebenezer chapel has been shortlisted for one of the prestigious 2017 Royal Institute of Chartered Surveyors Awards, Wales. There are six categories covering Building Conservation, Community Benefit, Commercial, Design Through Innovation,Regeneration and Tourism and Leisure. “These awards showcase the top built environment projects in Wales, along with the talent and skills of the teams behind them. Every year I wonder how we are going to top the previous year’s shortlist, but I am never disappointed. Many of this year’s nominees are unique and pioneering, and have transformed local communities”. In a little over three months, Cornerstone has already attracted a wide range of events and users. Charity Functions, fund raising events,entertainment and ‘The Pantry’ cafeteria are all proving popular beyond expectation due, in no small part, to the professionalism of the Spiro’s Catering team. School days and other educational outreaches are being currently planned. Cornerstone is already proving to be a unique asset for the city of Cardiff.